Iron Stache: Do you know why teachers are being murdered? "Looking down at you, not down on you"
Do you know why teachers are being murdered? I learn about a lot of goings on through social media. I actually prefer learning what's going on in the world that way. I get to choose who I pay attention do - the media doesn't get to choose what I see. One story that caught my eye was on the verge of being unbelievable. It had to do with teachers. In Wisconsin, we are aware of the kinds of attacks that are being faced every day. After Scott Walker was elected dictator, one of the first things that he did was go after public employees - to include public educators - with Act 10. Not only did this take away the teachers' voice with regard to working conditions, but, his budget also included the largest funding cuts to public education in the history of the state! Attacks on education are going on all across the world. Working and living conditions are bad here, but, teachers are not being imprisoned or killed for standing up for their students. At least not yet. Not here. 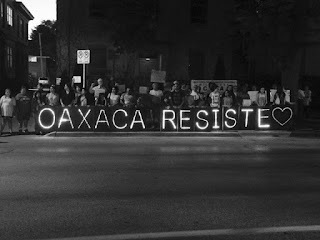 "On Sunday night, June 12, as Ruben Nuñez, head of Oaxaca’s teachers union, was leaving a meeting in Mexico City, his car was overtaken and stopped by several large king-cab pickup trucks. Heavily armed men in civilian clothes exited and pulled him, another teacher, and a taxi driver from their cab, and then drove them at high speed to the airport. Nuñez was immediately flown over a thousand miles north to Hermosillo, Sonora, and dumped into a high-security federal lockup. Six people have been killed in southern Mexico in clashes between protesting teachers and police. More than 100 other people, including many police officers, were injured. 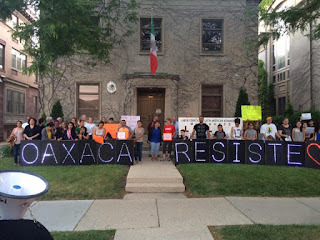 If you'd like to know a little more about what's going on, please check out the following link from "In These Times"
On Friday night a few friends got together on the front lawn of the Mexican Consulate in Milwaukee to do what friends do - stand up for each other. 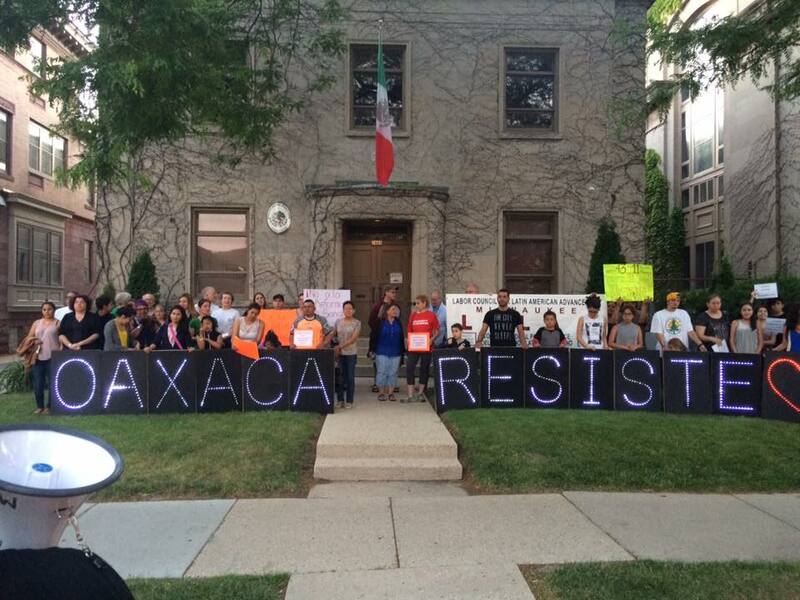 We wanted to bring attention to what's going on in Mexico and educate the public. It's what educators do. I'm not a teacher, but, who I am is a result of them. Please - read about the story. Make some calls. Let people know. Here is a list of numbers and contacts. Iron Stache. Picture Window theme. Powered by Blogger.